It's better to be on the ground wishing you were in the sky than in the sky wishing you were on the ground...! Your safety is our number one priority, and your pilot will only fly you if he is confident that the conditions are right. Visibility: a minimum visibility of 5km and with a cloud base of at least 1000' above ground level is required - so we can't fly in low cloud or fog. Visibility varies at altitude - so good visibility on the ground does not always guarantee good visibility in the air. 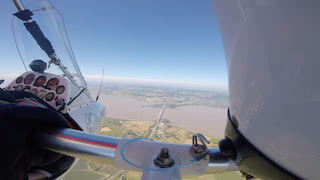 Wind: Ideal conditions for microlighting are 5-10 knots, but will fly in up to 15 knots depending on other factors such as turbulence and thermic activity. Wind direction also affects safe take off and landing. Rain: It isn't necessarily dangerous to fly in light rain - but it isn't very pleasant! We can sometimes sit out short sporadic showers - so don't assume your flight is cancelled if showery weather is forecast. However, if rain is persistent we will reschedule your flight so that you have a more enjoyable experience. How do we make a decision about whether to fly? We will make a decision based on various weather forecasts. The closer the forecast to the time of your flight, the more accurate it is likely to be - so please call for a weather check either on the morning of your flight or the evening before. Please don't make assumptions about the weather without speaking to us - only the pilot can make the final decision whether or not to fly - so do not leave home without having called! Red : we do not think the weather will be suitable and will cancel all flying. Customers will be offered alternative dates. Green : we think that the weather will be suitable, and flying will go ahead. However, if in the occasional event of weather conditions changing without warning, we reserve the right not to fly. Amber : the weather forecast is ambiguous. We will be on the airfield ready to fly. Any customers booked in to fly will be very welcome to come along and take a chance on whether or not their flight will go ahead - and we can keep in touch throughout the day via mobile phone to update them on conditions. Customers who would prefer not to take a chance will be rebooked. £5 per hour off when you book a course of 10 lessons! Book now to start your training! To train for NPPL, you should anticipate a cost of around £2500 - £3000 to cover your flying lessons, flight training, ground school and exams.